Update: We featured Mickey’s story back in 2014 and now she’s giving us a recap and an amazing update. She kept 62 pounds off for 2 years. Recently, she started working on her new fitness goal that has led to her losing 14 more pounds in 7 weeks and gaining 2.8 lbs of muscle. After not being able to walk up the stairs without losing my breath, I knew that something had to change. I no longer saw ME when I looked in the mirror. At the time, my daughter was 12 years old and I wanted her to be proud of me and I wanted to be here for her. So, on Nov 5, 2012 I decided to make a change. I even used my Instagram @BLKNRICANLUV to document my entire journey. It keep me honest and accountable. At the start, I weighed 222 pounds at only 5’2″ tall. I changed almost everything about my eating. I thought I was living life before. I was eating fast food 3/4 times a week, drinking alcohol every weekend and going out to diners at 4/5 am in the morning. I began eating 5 times a day – 2 nutritional meal replacements shakes, 2 snacks (protein and veggie) and 1 healthy meal. Stopped drinking juice and only drank water (120 oz every single day). I did the Insanity DVDs from day 1! I would cry, because my body couldn’t move in some positions like the people on the DVD, but I NEVER QUIT! I did a ran in place or did jumping jacks for the moves I couldn’t do. I lost 62 pounds and gained 15 pound of lean muscle in 1 year. I’ve keep it off for over 2 years! Now, as of March 5, 2016, I’m back working on a new goal: Walking across the stage as a NPC Bikini Competitor. I don’t have a date set yet, but it will be done! I’ve never been so excited to do something so scary. I never even owned a bikini before, but my baby sister has let me have one of hers so that I can document my new journey. In the last 7 weeks, I’ve lost an additional 14lbs and dropped my body fat by 6.5% I also put on 2.8lbs of lean muscle! Never give up! Always set new goals and be proud of where you are! Most importantly, know that you are your only competition!! 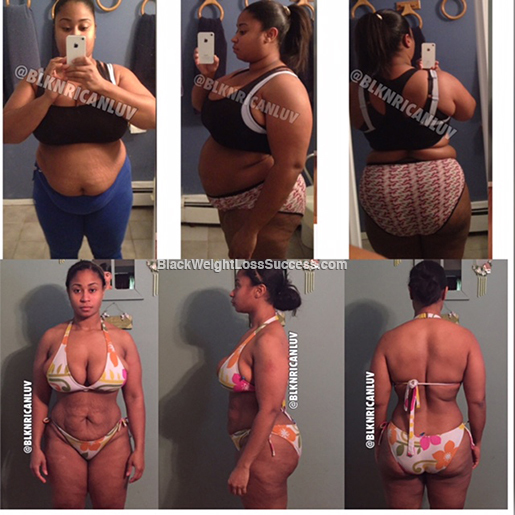 Check out the post from 2o14 about her journey for more info on how she did it. I’m so proud these woman have taken control of their lives.